Captivating Alyce Paris prom dress 6759 is a dazzling choice for your senior prom. This impressive gown showcases a strapless neckline on the fitted bodice encrusted with starburst pattern beads and crystals. 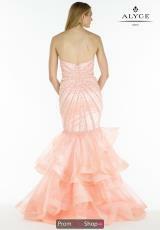 The mermaid flared lower skirt has layers of sparkly organza with a back sweep train for a dramatic exit. See more phenomenal Alyce Paris gowns at PromDressShop.com.